RadGridView provides a straightforward way to use custom context menus, instead of the default one. This context menu will appear every time the user right-clicks the RadGridView, regardless of the element of the control they click. Figure 1: Custom Context Menu. Start by creating the context menu, initializing its items, and subscribing for the events that you want to handle to achieve the desired behavior. 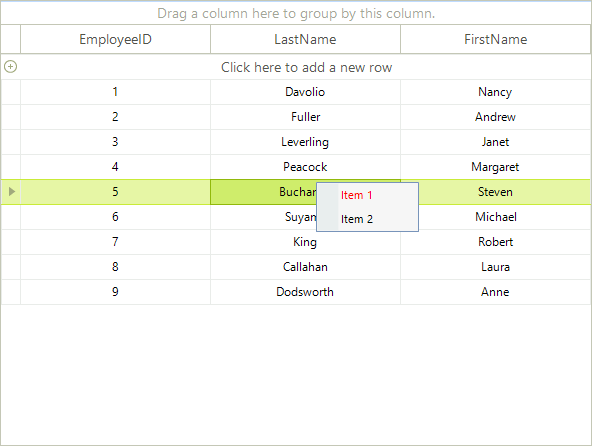 Note: You will need Telerik.WinControls.UI namespace added to your "Using" (C#) or "Imports" (VB).